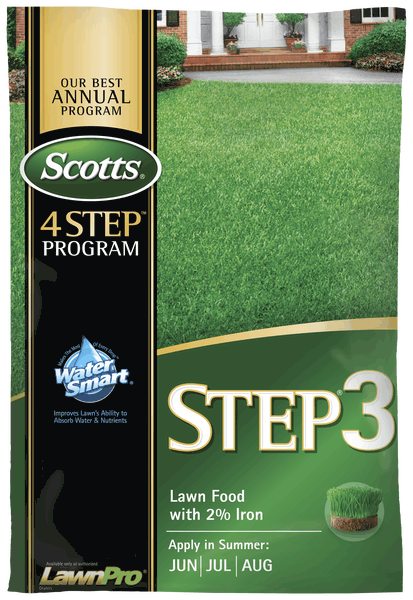 Scotts® STEP® 3 Lawn Food With 2% Iron can be applied for a great green-up. It also strengthens the lawn against heat and drought. Utilize Scotts® STEP® 3 Lawn Food With 2% Iron, and the entire Scotts® 4 Step program, for a better lawn! May be used on any grass type. Apply to wet or dry lawn. When temperatures are consistently exceeding 90°F, water immediately after application to reduce stress on your lawn. For best results, use a Scotts® spreader. This product is not designed for use on ornamentals or mulch, If accidently applied to ornamentals, wash immediately off the plants. While it is just a fertilizer, it is designed for use on the lawn only. It could possibly burn if applied to ornamentals. Can be safely used under the dripline of trees.